(CNN) – While the countdown to the next presidential election has already begun with talk of potential contenders, it felt like the 2016 drumroll picked up a little more speed Friday night in South Carolina. 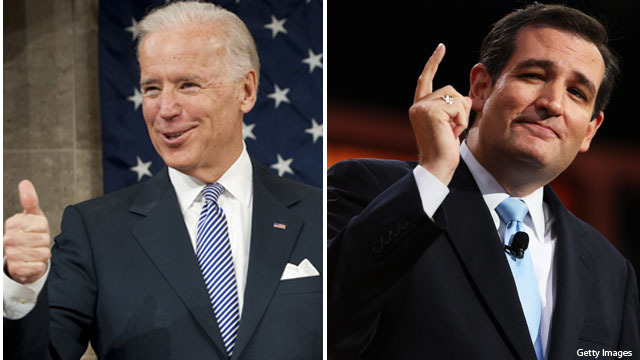 Vice President Joe Biden and Republican Sen. Ted Cruz of Texas headlined events less than two miles apart in the Palmetto State, known for holding the first presidential primary in the South during election years. And Biden, who was a guest at South Carolina Democratic Party’s Jefferson Jackson dinner, was aware of the spotlight. Candidates seeking the White House traditionally make stops in South Carolina, along with the other early voting states of Iowa and New Hampshire, as a way to tap into the state’s political establishment and fundraising resources. Biden also tipped his hat to the special congressional election in South Carolina, a high profile race that pits Democrat Elizabeth Colbert Busch, the sister of satirist Stephen Colbert, against former GOP Gov. Mark Sanford, who’s trying to make a political comeback after an extramarital affair tarnished his reputation. But the vice president mostly focused on current issues facing Washington, and argued that Republicans are simply piggybacking on the Democratic Party’s message to help the middle class. “All of a sudden, since the last election, you hear our Republican friends talk about how much they value the middle class. I bet it's going on over at that silver elephant thing,” he said. That “silver elephant thing’ happened to be the GOP Silver Elephant annual dinner in Columbia where Cruz began speaking merely minutes after Biden wrapped up his remarks. This year’s event was held in honor of former Sen. Jim DeMint, who resigned from his seat at the end of 2012 to head the Heritage Foundation, a conservative think tank in Washington. In addition to Cruz, a number of familiar faces addressed the dinner either in person or by video, including Sens. Lindsey Graham and Tim Scott of South Carolina, Sen. Marco Rubio of Florida, Sen. Pat Toomey of Pennsylvania, Sen. Jeff Flake of Arizona, and Gov. Nikki Haley. Shortly after stepping on stage as they keynote speaker, Cruz acknowledged the Democratic gathering down the road. Cruz dedicated a large portion of his speech to DeMint, thanking the former senator for supporting him and other conservatives in Republican primaries when they were underdogs at the time facing establishment candidates. DeMint became known as a kingmaker among conservative Republicans, using his power to back candidates like Cruz, Rubio, Flake, Sen. Mike Lee of Utah and Sen. Rand Paul of Kentucky—all of whom have been elected since 2010. Noting his Texan roots, Cruz took the opportunity to inject a Chuck Norris joke, as well. “You know, some people wear Superman pajamas. Well, Superman wears Chuck Norris pajamas, and Chuck Norris wears Jim DeMint pajamas,” he said. Known as a rising star in the GOP, Cruz was not shy about touting his headline-making moments in his thus-far four months in the Senate. He pointed to his grilling of U.S. Attorney General Eric Holder over the government’s drone policy and his assistance in Sen. Paul’s 13-hour talking filibuster later that day. The first-term senator, who spoke earlier Friday at the National Rifle Association convention in Houston, also reminded the audience of his joint-threat to filibuster the gun control package with Sens. Paul and Lee. Other Republican senators also vowed to block the legislation, but their filibuster was overcome days later. In his speech, Cruz focused on themes of growth and opportunity—two areas in which he says the Obama administration is failing the American people. But Cruz also made sure to play to his audience Friday night; he referred to Gov. Haley as a “rock star” and sang the praises of Sens. Scott and Graham. He also highlighted South Carolinians who fought in the Battle of the Alamo in 1836. Republican policies wrecked our economy; Democratic ones are slowly getting us out of the ditch. That's all you need to know. And if you're dumb enough to believe all the Republican spew, well, then, you deserve to be lied to. What about Steven Seagal's pajamas ? And why dose Republican Sen.Ted Cruz look and act like "Joe" McCarthy ? Souh Carolina is bunch of idiots. Looks just like Joe McCarthy of the 50s'. Talks and acts like him to. The Gop is sure to back this moron to the hilt. A perfect fit for the GOP and the NRA. The poster child of what is wrong in this country. Just who does Ted Cruz think he is? Well, he is arrogant, obnoxious, and scary. But the really scary part is that he's only been in office a few months and the misinformation (lies) that he's already put forth are just the beginning. Be afraid. Be very afraid. This guy will say anything. If I was not able to vote for Sarah Palin, I can never vote for another clueless Ted Cruz even if it happened I become blind. This guy who was supported by this woman who has no shame at all, can not lead any country on earth. They are both disgusting and they are not aware how civilised people have to live. Send them to a place of no return, and they should be stuck there, for ever and ever. AMEN. The republican party's mascot use to be an elephant, now it's a mastodon.